"Judith Ann Ostrovitz and Sharon Christine Culver, Westbrook College, C"
Westbrook College student Judith Ann Ostrovitz, Class of 1978, was a Fashion Merchandising major and a Day Hop; Sharon Christine Culver was a Fashion Merchandising major and lived in Linnell Hall. 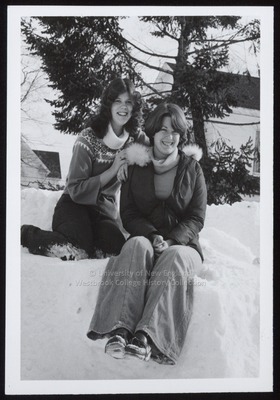 For their senior class candid photo, which appeared in the 1978 Tower Yearbook, Judith Ann wore dark slacks, an oversize Fair Isle sweater and a pale cowl neck jersey; Sharon wore bell bottom jeans with a pale cowl neck jersey and a dark ski jacket with fur lined hood. Judith's hair was long and curly; Sharon's was short and parted on the side. The two young women sit atop a snow bank. Judith Ann kneels and leans against Sharon's shoulder, and Sharon dangles her loafer clad feet over the edge of the banking.